Europe chooses to deny economic reality. Recent European elections have made it clear that neither French nor Greek voters are at all interested in having their governments spend less money on them. The new President of France ran on the tired old program of "taxing the rich" - who are, predictably enough, making plans to move to England. The Greek politicians who promised to cut government spending as a condition of getting loans from Europe, for which read German taxpayers, were beaten by parties who promised to repudiate the cuts and add thousands of new government jobs to reduce unemployment. Our leftist punditocracy is rejoicing - sensible European voters have rejected austerity! Their governments can get back to good 'ol stimulus and we'll soon pull out of the recession, just as John Maynard Keynes, the patron saint of useless spending, predicted! A bright new day dawns for government spending, hallelujah! It isn't that simple, of course. In contract to France, which recently lost its AAA bond rating because of concerns about mounting deficits and 10% unemployment, Germany had a trade surplus of 158 billion Euros last year and unemployment fell to 6.6%. The only way that free-spending European governments can continue spending is for the Germans to cover their deficits as the Chinese have covered our deficits. German voters are signaling discontent with the past German-funded bailouts - Ms. Merkel, the German prime minister, recently lost a by-election. She doesn't have much room for increased spending if she wants to stay in power beyond the next election. The rulers of China don't have to worry about elections, but they're well aware that their workers are wanting to consume more instead of subsidizing our excessive spending by buying US government securities. The bottom line is that the good times can roll only so long as someone else is willing to pick up the check. So far, Germany has covered deficits in Greece, Spain, and Italy, but that can't go on forever. 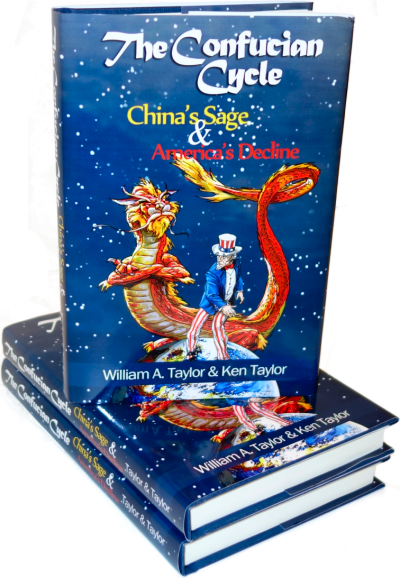 China has covered our deficits, but they, too, are rumbling about not wanting to pay our way any more. Let's do a simple mental exercise and forget about money for the moment. Money is merely a claim on the output of the economy whose government issued the currency. If you have a dollar, you're entitled to one dollar's worth of whatever goods and services produced by the American economy you may choose to buy. The problem is that whatever you want, whether it be goods made in a factory, services performed in a hospital, or anything else, it has to be produced by someone. Consumption has to be balanced by production, which requires that someone do the work. These population figures tell us we have a problem. 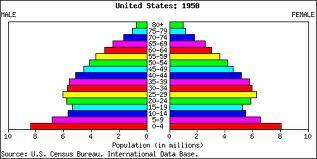 In 1950, there were relatively few 80-year-olds compared to the rest of the population. The biggest bulge was people in their twenties and thirties who were in their prime earning years but weren't having enough children to replace themselves. That bulge of people got older, of course. You can see that by 2000, those early earners were getting close to retirement. There's not a whole lot of doubt what's going to happen in 50 years because all the people who'll be 60, 70, or 80 in 2050 have already been born. 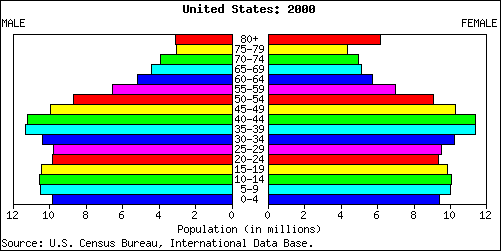 Assuming that we don't have a war or a plague, nearly all those people will continue to get older and most of then will still be around in 2050. Long after they stop producing, they'll want to continue eating, visiting doctors, driving cars, and consuming other goods and services which have to be produced by someone else. The British are further along this path than we are. They estimate that about half of the people in their 60's, 70's and 80's will need nursing home care for years on end. Ignore the issue of who pays for it. If you visit a nursing home, you'll find that it's staffed 24/7/365 three shifts per day. The total employment is greater than the number of residents. There's a veterans home near me with 600 employees for 400 residents. Assume that half the oldsters will need nursing home care and that each oldster requires one nursing home employee. 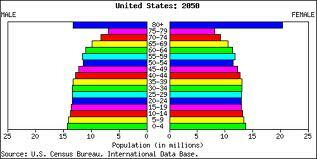 Take half the bars representing 60-80 year-olds in 2050 and subtract them from the working population. It doesn't matter who pays. The money's irrelevant - no matter how much we pay, we won't have enough workers to take care of all the old people and do all the other work our economy needs. What's worse, many of the people who could be working in 2050 won't be working, they'll be on welfare. Greek politicians appointed thousands of relatives and supporters to government jobs where they didn't have to show up for work but could earn generous pensions. These people know that they'll be the first to lose their jobs in any sensible cost-reduction program and voted accordingly. So did all the other sponges. At age 19, I dropped out of school to pursue a career as a French horn player. After a few twists and turns, I wound up in the Barcelona Symphony, which was a Spanish government job. Consider this lip-challenged "disabled" musician. He'll consume for 20 years without contributing anything, then he'll retire. If he ends up in a nursing home, he'll consume even more. The author emigrated to America. He and his wife were poor for a while but came to appreciate the difference between the American attitude of "earned success" and the European view of "learned helplessness." Many Europeans are unemployed because of job-destroying government policies. More than half of Spanish young people are unemployed. They're blocked from earning success so they either riot to keep their unearned government benefits or emigrate. The New York Times explained where the entitlement state goes if it runs long enough. Why are most Indians without hope? Because the Bureau of Indian Affairs has been taking care of them since 1824. No sensible bureaucracy ever lets customers graduate out of the program. Anybody with enough maturity to want to support himself and enough education to earn money doesn't need the agency any more. They'll lock 'em in forever no matter what it takes. The welfare system didn't start taking care of non-Indians in large numbers until the 1970's. Having raised three generations of welfare recipients, we're seeing the same family breakdown and substance abuse as on Indian reservations on a larger scale. Unemployment in the welfare ghettos may be less than the 70% unemployment on the Indian reservations but it's getting there. Welfare recipients in America suffer from the same "learned helplessness" as in Europe. It's worse among Indians because they've been "taken care of" by the Great White Father in Washington for a lot longer than the rest of the welfare community. European voters have made it plain that they don't want their benefits cut. German voters have made it clear that they're tired of funding learned helplessness. Politicians on the left see opportunity to persuade voters to vote for more benefits regardless of the underlying reality. Our 2012 election is about precisely the same issue. Will Americans vote for more benefits and send us further along the unsustainable path of learned helplessness and hopelessness? Or will we turn back toward earned success, as voters in Wisconsin seem to have spoken for? The choice is ours.